Thiamine helps with blood formation and the metabolism of carbohydrates, and plays a role in the conversion of blood sugar to energy. Additionally, it supports nerve tissues and nerve function. Thiamine is involved in the conversion of fatty acids and amino acids into hormones, proteins and enzymes. It is necessary for healthy muscle function, especially in the heart. Thiamine may support health in people with Alzheimer’s disease . Supplementation may also benefit those suffering from a number of other neurological conditions [2-4]. Vitamin B1 deficiency has been associated with the use of diuretic drugs used to treat congestive heart failure . Studies indicate that people who have diabetes may also be Thiamine deficient . Lastly, anemia may be responsive to supplementation with Thiamine [7-8]. Riboflavin, in addition to keeping our skin, nail and hair healthy, is essential for normal growth and development, reproduction, lactation, physical performance and well being. Riboflavin belongs to a group of yellow fluorescent pigments called flavins and, when excreted, gives urine the characteristic yellow color. Riboflavin aids in energy production for the body and is instrumental in the metabolism of fatty acids and amino acids. Additionally, it is an antioxidant (meaning a chemical that reduces the rate of specific oxidation reactions involving the transfer of electrons from a substance to an oxidizing agent), providing targeted protection for the eyes and may help prevent cataracts . High doses of Riboflavin may also help in the treatment of migranes . Finally, Riboflavin deficiency may be linked to depression . Niacin is required for cell respiration (meaning metabolic reactions and processes that take place in a cell to obtain chemical energy) and helps in the release of energy and metabolism of carbohydrates, fats and proteins, proper circulation and healthy skin, functioning of the nervous system, and normal secretion of bile and stomach fluids. There are three forms of niacin on the market today; Nicotinic Acid, Nicotinamide and Inositol Hexaniacinate. Nicotinic Acid and Inositol Hexaniacinate have shown promise in controlling cholesterol levels ; Inositol Hexaniacinate does not cause the tingling redness commonly associated with Nicontinic Acid. Nicotinamide has been used in the treatment of diabetes [13-15] and arthritis . Pantothenic acid was named after the Greek word pantothen (meaning everywhere) because it is present in all cells. It plays an important role in supporting the adrenal gland and is required for the production of adrenal hormones . Pantothenic acid is also important for the release of energy and the metabolism of fat, protein and carbohydrates. 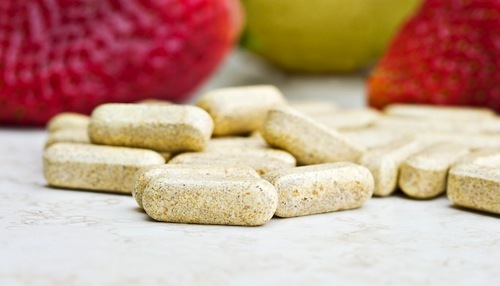 It may speed wound healing and recovery from surgery, especially when taken with vitamin C .
Vitamin B6 is instrumental in more than 100 enzyme reactions in the body, mostly related to the metabolism of amino acids and proteins. Vitamin B6 deficiency is one of the most common nutritional deficiencies, predominantly due to the loss of vitamin B6 during cooking and food processing. Vitamin B6 is involved in the production of red blood cells and neurotransmitters like serotonin, which play a part in regulating our moods and preventing depression [19-20]. Intake of vitamin B6 may reduce the risk of Parkinson’s disease by 50% [21-22]. Vitamin B6 is involved in metabolism of homocysteine, an amino acid that is a risk factor for atherosclerosis [23-24]. Dietary supplementation of vitamin B6 along with vitamin B12 and folic acid can decrease homocysteine levels . Supplementation of vitamin B6 may also be beneficial for people with rheumatoid arthritis  and asthma . Biotin is instrumental in the production of energy from the metabolism of carbohydrates and fats. It is also used in cell growth and the production of fatty acids. Bacteria in the intestines produce a large amount of Biotin. Biotin may lower blood sugar levels in diabetics while improving nervous disorders associated with diabetes . Folic Acid was named after the Latin word folium (meaning leaf) because it was originally isolated from spinach leaves. 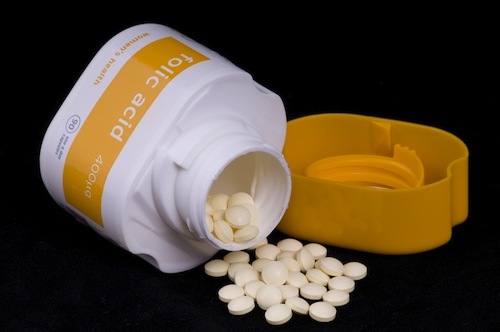 Similar to vitamin B12, Folic Acid is necessary for the production of both DNA and RNA, making it essential for proper cellular division and the transfer of genetic information. Folic Acid is essential for the health of red blood cells . Folic Acid is required for closure of the fetus’ neural tube during pregnancy, making it an essential vitamin for preventing neural tube birth defects. Women with higher intakes of Folic Acid may have a reduced risk of ovarian cancer . Folic Acid supplementation together with vitamins B6 and B12 has been effective in enhancing cognitive performance in older adults . Additionally, Folic Acid supplementation may prevent the development and progression of atheroslerosis through reduction in homocysteine levels . As homocysteine can also affect normal bone structure, the homocysteine-lowering properties of Folic Acid may be beneficial in the prevention of osteoporosis . Vitamin B12 is essential for growth and plays a role in the metabolism of cells, especially those of the gastrointestinal tract, nervous system and bone marrow. Animal protein products are the only dietary source of vitamin B12, as it is produced by bacteria in the digestive tract. Similar to folic acid, vitamin B12 is necessary for the production of both DNA and RNA. Vitamin B12 is also important for the function and maintenance of the nervous system and red blood cells. One of the most important features of vitamin B12 is the prevention of elevated levels of homocysteine. Elevated homocysteine levels increase the risk of developing atherosclerosis . Vegetarians need to be careful of vitamin B12 deficiency, which could increase the risk of hyperhomocysteinaemia . Vitamin B12 supplementation together with vitamin B6 and folic acid has been effective in enhancing cognitive performance in older adults . Additionally, vitamin B12 may treat symptoms of Crohn’s disease . It also may ease symptoms for people with bronchial asthma . Mimori et al. Thiamine therapy in Alzheimer’s disease. Metab Brain Dis. 1996 Mar;11(1):89-94. Ishibashi et al. Reversible acute axonal polyneuropathy associated with Wernicke-Korsakoff syndrome: impaired physiological nerve conduction due to thiamine deficiency? J Neurol Neurosurg Psychiatry. 2003 May;74(5):674-6. Crespi and Jouvet. Sleep and indolamine alterations induced by thiamine deficiency. Brain Res. 1982 Sep 30;248(2):275-83. Skelton and Skelton. Thiamine Deficiency Neuropathy. It’s Still Common Today. Postgrad Med. 1989 Jun; 85(8):301-06. Seligmann et al. Thiamine Deficiency in Patients with Congestive Heart Failure Receiving Long-term Furosemide Therapy: A Pilot Study. Am J Med. 1991 Aug;(2):151-55. Saito et al. Blood Thiamine Levels in Outpatients with Diabetes Mellitus. J Nutr Sci Vitaminol.(Tokyo). 1987 Dec;33(6):421-30. Mandel H, et al. Thiamine-dependent Beriberi in the Thiamine-responsive Anemia Syndrome. N Engl J Med. 1984 Sep;311(13):836-38. Boros et al. Defective RNA ribose synthesis in fibroblasts from patients with thiamine-responsive megaloblastic anemia (TRMA). Blood. 2003 Nov 15;102(10):3556-61. Leske et al. Biochemical Factors in the Lens Opacities. Case-control Study. The Lens Opacities Case-Control Study Group. Arch Ophthalmol. 1995 Sep;113(9):1113-19. Schoenen et al. Effectiveness of High-dose Riboflavin in Migraine Prophylaxis. A Randomized Controlled Trial. Neurology. 1998 Feb;50(2):466-70. Carney et al. Thiamine, Riboflavin and Pyridoxine Deficiency in Psychiatric In-patients. Br J Psychiatry. 1982 Sep;141:271-72. Gardner et al. Combination of Low-dose Niacin and Pravastatin Improves the Lipid Profile in Diabetic Patients without Compromising Glycemic Control. Ann Pharmacother. 1997 Jun;31(6):677-82. Pozzilli et al. Meta-analysis of Nicotinamide Treatment in Patients with Recent-onset IDDM. The Nicotinamide Trialists. Diabetes Care. 1996 Dec;19(12):1357-63. Polo et al. Nicotinamide Improves Insulin Secretion and Metabolic Control in Lean Type 2 Diabetic Patients with Secondary Failure to Sulphonylureas. Acta Diabetol. 1998 Apr;35(1):61-64. Crino et al. A randomized trial of nicotinamide and vitamin E in children with recent onset type 1 diabetes (IMDIAB IX). Eur J Endocrinol. 2004 May;150(5):719-24. Jonas et al. The Effect of Niacinamide on Osteoarthritis: A Pilot Study. Inflamm Res. 1996 Jul;45(7):330-34. Tarasov et al. Adrenal Cortex Functional Activity in Pantothenate Deficiency and the Administration of the Vitamin or Its Derivatives. Vopr Pitan. 1985 Aug;(4):51-54. Lacroix et al. Role of Pantothenic and Ascorbic Acid in Wound Healing Processes: In Vitro Study on Fibroblasts. Int J Vitam Nutr Res. 1988;58(4):407-13. Adams et al. Effect of Pyridoxine Hydrochloride (Vitamin B6) upon Depression Associated with Oral Contraception. Lancet. 1973 Apr;1(7809):899-904. Bernstein AL. Vitamin B6 in clinical neurology. Ann NY Acad Sci. 1990;585:250-60. De Lau et al. Dietary folate, vitamin B12, and vitamin B6 and the risk of Parkinson disease. Neurology 2006 Jul 25;67(2):315-8. Wang et al. Vitamin B(12) and folate in relation to the development of Alzheimer’s disease. Neurology. 2001 May;56(9):1188-94. Brattstrom et al. Impaired Homocysteine Metabolism in Early-onset Cerebral and Peripheral Occlusive Arterial Disease. Effects of Pyridoxine and Folic Acid Treatment. Atherosclerosis. 1990 Feb;81(1):51-60. McKinley et al. Low-dose vitamin B-6 effectively lowers fasting plasma homocysteine in healthy elderly persons who are folate and riboflavin replete. Am J Clin Nutr. 2001 Apr;73(4):759-64. Woodside et al. Effect of B-group vitamins and antioxidant vitamins on hyperhomocysteinemia: a double-blind, randomized, factorial-design, controlled trial. Am J Clin Nutr. 1998 May;67(5):858-66. Kremer et al. Nutrient Intake of Patients with Rheumatoid Arthritis is Deficient in Pyridoxine, Zinc, Copper, and Magnesium. J Rheumatol. 1996 Jun;23(6):990-94. Reynolds and Natta. Depressed Plasma Pyridoxal Phosphate Concentrations in Adult Asthmatics. Am J Clin Nut. 1985;41:684-688. Koutsikos et al. Biotin for Diabetic Peripheral Neuropathy. Biomed Pharmacother. 1990;44(10):511-14. Gutierrez et al. Influence of biochemical and genetic factors on homocysteine concentrations. An Pediatr (Barc). 2004 Mar;60(3):215-21. Larsson et al. Dietary Folate Intake and Incidence of Ovarian Cancer: The Swedish Mammography Cohort. J Natl Cancer Instit. 2004 Mar;96(5):396-402. Calvaresi and Bryan. B vitamins, cognition, and aging: a review. J Gerontol B Psychol Sci Soc Sci. 2001 Nov;56(6):P327-39. Swain and St Clair. The Role of Folic Acid in Deficiency States and Prevention of Disease. J Fam Pract. 1997 Feb;44(2):138-44. Cagnacci et al. Relation of homocysteine, folate, and vitamin B12 to bone mineral density of postmenopausal women. Bone. 2003 Dec;33(6):956-9. Lindeman et al. Serum homocysteine concentrations and their relation to serum folate and vitamin B12 concentrations and coronary artery disease prevalence in an urban, bi-ethnic community. Ethn Dis. 2003;13(2):178-85. Waldmann et al. Homocysteine and cobalamin status in German vegans. Public Health Nutr. 2004 May;7(3):467-72. Imes et al. Iron, Folate, Vitamin B12, Zinc, and Copper Status in Outpatients with Crohn’s Disease: Effect of Diet Counseling. J Am Diet Assoc. 1987 Jul;87(7):928-30. Simon SW. Vitamin B12 Therapy in Allergy and Chronic Dermatoses. J Allergy. 1951;22:183-85.